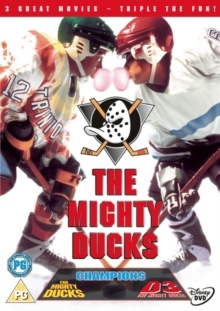 Collection of all three Mighty Ducks adventures following the fortunes of a very special ice hockey team. In 'The Mighty Ducks Are the Champions' (1993) Gordon Bombay (Emilio Estevez) is a luckless yuppie forced to do community service after being caught drink driving. His penance is to train one of the worst ice hockey teams in the world. However, while Gordon tries to whip them into shape, he learns from his new team that winning is not always everything. In 'D2 - The Mighty Ducks' (1994), the action takes place at the Junior Goodwill Games in LA, as Bombay is invited to lead Team USA to victory over the favourites, Iceland, whilst also having to cope with the distractions of an enveloping media circus. In 'D3 - The Mighty Ducks' (1996), the Ducks are about to begin a scholarship at a prestigious new school, which means a new, no-nonsense coach (Jeffrey Nordling). An icy reception from the school hockey team results in a loss in the Ducks' form. Can they defeat the unbeaten senior team and regain their reputation?